Icon on canvas: "St. Xenia of St. Petersburg, Yurodivaya"
Yurodivaya is the Russian word used to describe saints of the category of 'fool-for-Christ', which is to say holy fools. 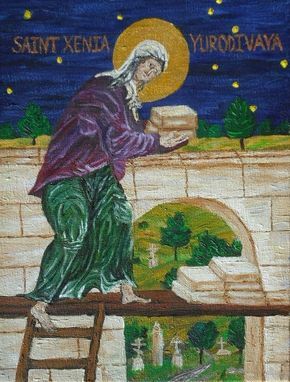 This icon is based on a story where st. Xenia carried stones to the rafters of a church which was under construction, for the workers to lay the next day. Mind you, when she did this, she was in her fifties.